The Greek Myths exist in many variants, and one of the challenges facing any author is what perspective to take and what variant to follow. The plot is laid out already, and may be known to some readers, so for a novel to be successful it has to bring freshness to the story telling and to make the characters live again in a new way. The Song of Achilles works in this regard – while I knew the story in outline, and was aware of what would happen to the main characters, Miller brought it alive, and made me empathize with them. The Song of Achilles follows Patroclus from his early life, through his exile and the start of his friendship with Achilles while they were children. We follow them through the eyes of Patroclus throughout the main events of their lives to the Siege of Troy and their respective deaths. The relationship between Achilles and Patroclus has been portrayed in different ways in different versions of their story, most commonly as a close male friendship (a bromance in contemporary terminology), but in this telling the relationship is unashamedly a sexual one. Therefore, at one level, The Song of Achilles is simply a love story. Of course, the relationship between Achilles and Patroclus is rather more complex than that, and there are other important players in the story. Thetis, the sea nymph mother of Achilles, is a vital and continuing presence, albeit a mysterious and other worldly one. But other characters, Odysseus, Agamemnon, Briseis, Chiron spring to life in a way which makes their actions and motivations seem real and vital. Some of the set pieces – the scene where the Greek Kings bid for the hand of Helen, the speech of Achilles when plague has broken out in the Greek camp, the final battle scene leading up to the death of Patroclus – have a real tension, even when the reader knows the outcome in advance. 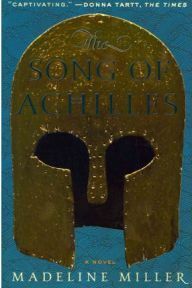 The Song of Achilles won this year’s Orange Prize for Fiction. It was a deserving winner – a very engrossing work of literary fiction which is one of the most enjoyable books I have read this year. One Comment on "The Song of Achilles"
One of my favourite this year as well. I breeze through it very quickly eager to find out what happens at the end, but it is worth a re-read.